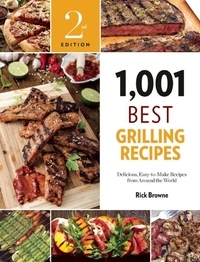 Author Rick Browne is known as one of the country's foremost authorities on grilling. The creator and host of the PBS TV series Barbecue America, Browne is also the author of twelve cookbooks, most of which deal with barbecue and grilling. In this volume, he's created an encyclopedic collection of recipes drawn from cuisines around the world, with a particular focus on North American and Asian traditions. Never before have this many great grilling recipes been collected into one tome. If you love to grill--or know someone else who does--this is a must-have resource. It's the only grilling recipe book you'll ever need.